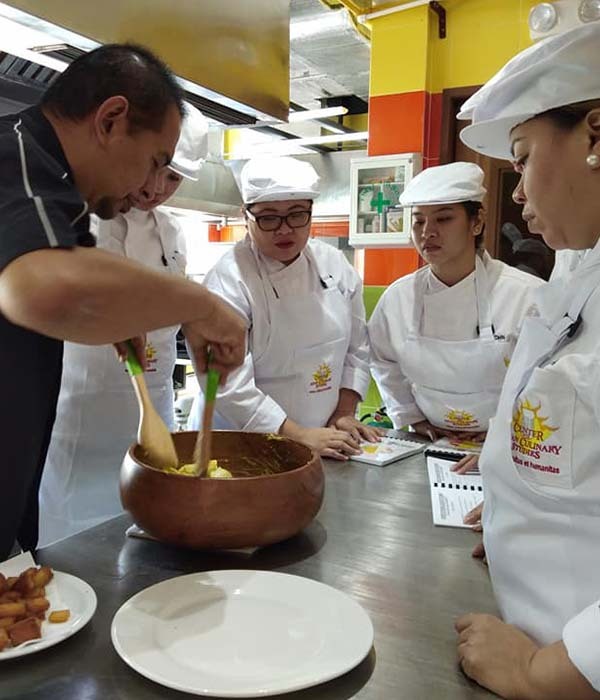 The Center for Asian Culinary Studies opens its third extension school in one of the oldest citadels of culinary arts and gastronomy. Pampanga because of its agricultural trade and products has maintained a population immersed in over 2 centuries of excellence in cuisine. The culinary school is located in the bustling city of Angeles which is recognized as a main center for business and education and is ready to service the growing needs for professional Chefs. Chef Gene Gonzalez, a pure bred Capampangan from Apalit and Arayat has recognized the need to share the “CACS method” to his Cabalens and the neighboring provinces such as Bulacan, Tarlac, Pangasinan, Bataan, Zambales and Nueva Ecija that have their own rising growth and hospitality centers. CACS Angeles opens its doors to offer some very exciting courses featuring the latest in applications in the field of culinary and pastry arts. Our faculty comprising top industry consultants will be sharing their experience and know how using the student centered CACS method. Get the global edge. Enroll in CACS!